Stone has been extracted for centuries in Nidderdale where it has been of considerable economic importance. Quarrying was one of the chief industries of the dale until the First World War, and in Upper Nidderdale alone there are over two hundred sites at which extraction has taken place. The majority of workings were for sandstone but in the areas of Greenhow, Stean and Lofthouse limestone prevailed. Sometimes a small quarry was used for one building only, but other quarries were large enterprises. Stone quarrying came into its own with the great rebuilding of homes that took place from the 17th century onwards, although stone had been used and worked in monastic times. The local sandstone has strength, hardness, durability, porosity and colour. The quartz grains are often covered with a layer of mica along the bedding plane, and this allowed the rock to be readily split, forming flagstones. It was thus highly valued in industry and agriculture for its use in building and construction, paving and roofing, for roads and for ornamental purposes. 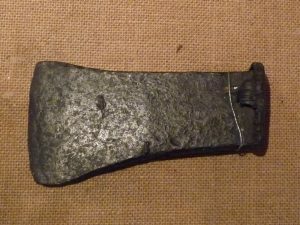 The wedge measures 9cm in length and appears well used for splitting stone from the quarry face. Great manual effort with hard graft was commonplace, and working conditions could be exceptionally harsh, especially in winter.